Professor Cheng Man-Ching shows the relaxed and soft style, combined with powerful pushes, that characterized his push hands technique. ... Martial arts expert, Robert Smith, who introduced the Professor to Westerners, pulled together the 8mm videos collected on this DVD. 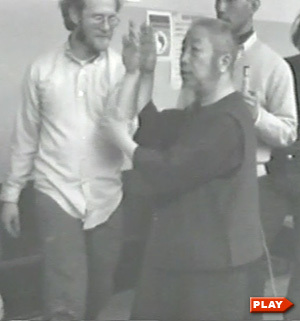 This is the last known video of Professor Cheng doing push hands (here pictured pushing Ed Young). This is the earliest video of Professor Cheng Man-Ching pushing hands. ... Robert Smith narrates as the Professor shows his exceptional pushing power (here pictured pushing a young William C. C. Chen). We also see him resisting groups of men pushing on him and one of his students being punched repeatedly - to demonstrate the internal strength that Tai Chi helps develop. Professor Cheng gives detailed push hands instruction while demonstrating correct positioning, the techniques for pushing effectively, and the need for lightess, relaxation, and gradual movements. ... With some quick and lite strikes he shows how the principles tie into martial arts. Well-known senior Tai Chi instructors participating include Ed Young, Tam Gibbs, Ken Van Sickle, and Lou Kleinsmith. Professor Cheng explains and shows how to make strong pushes, not by using strength or being heavy, but by being light, following the opponent's center, and preventing escape. ... He demonstrates how certain positions leave the pusher vulnerable to high speed, martial arts attacks and emphasizes taking care of any threatening hand - without blocking. Senior Tai Chi instructors participating include Maggie Newman, Mort Raphael, Tam Gibbs, and Ed Young. Professor Cheng continues his explanations and demonstrations of correct techniques for pushing and for responding to attacks. The push must be in exactly the right direction and must not be too heavy. Take force to one side. ... Don't get excited, for example by letting your shoulders come up, or you'll get locked up. Senior students Ed Young, Tam Gibbs, Mort Raphael, Stanley Israel, and Maggie Newman get schooled. Professor Cheng pushes hands with some senior students, including Stanley Israel, Maggie Newman, and Lou Kleinsmith, who became well-known Tai Chi instructors themselves. ... Ed Young translates for Professor Cheng as he gives the class instructions in advanced push hands principles. This video shows Professor Cheng pushing with two of his senior students, Tam Gibbs and Ed Young, both of whom went on to become well-known Tai Chi teachers. ... The videographer and narrator is Ken Van Sickle, who was also a senior student who later founded a Tai Chi and self-defense school.